Here in Mexico, as it is all over the world, and in any diving environment, You will often meet divers who dive beyond their certification because they do not want to take the time to hone the new skills. All they want to do is “The next cooler or bigger dive”. You will also meet divers who are afraid of taking the “plunge” to the next level for whatever reason. Those are 2 very different kinds of divers. As a full-time cave diver, I see this first one happening every day. 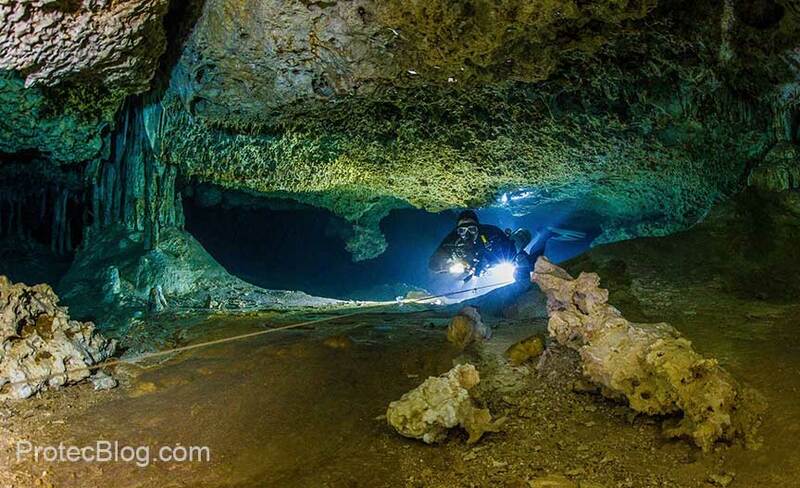 Be it the newly certified cave divers taking a stage(s) or certified Open Circuit cave divers coming back on Closed Circuit Rebreathers (CCR) to dive the same caves. Truth be told, this happens a lot of the time here in Mexico from local guides to sometimes even people trying to get fast-tracked to a cave instructor. You will remember that the very first rule is to “seek proper training “. Another one of the golden rules is “don’t dive beyond your certification”. These two “rules” go hand in hand with safety. One such example of the most common error I see in personal judgement is diving with stages. This seems to be a day-to-day occurrence here in Mexico. There is always a “reason” why this diver does not undergo a stage class. Here are a few of my favourites: “My friend took a class and they showed me” or “ I’ve seen it on the web and it looks easy”, or “I won’t take a class from X, who is he to teach me?”. One of my personal all-time favourites is “ I have my advanced nitrox and deco course. Isn’t it just the same?”. In short… No, it is not the same, not even close. I try to understand how their mindset works over something as dangerous as diving beyond their own certifications. I try to explain that anyone can dive with extra tanks, that part is simple. 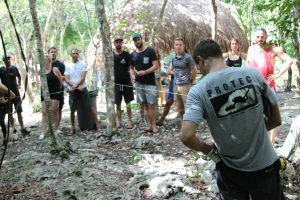 For a cave diver (as this is my business), I try to explain to them that there are a million different factors that influence a staged cave dive at any one time. I explain this is the reason why we take a course. Learning the small details, listening to how things are really done, and not just how you think they are done. Next, we go to the other kind of diver as we previously mentioned. This is where divers are afraid to take the next step in their education, for whatever reason. 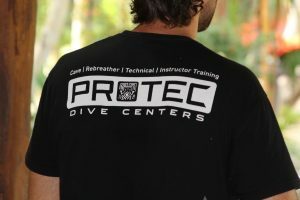 Maybe the dive industry does not do enough to show newer divers that “tech and cave” diving is easier than people think. Possibly the sight of divers using multiple tanks in the ocean, or in the cave is putting people off. Maybe the “ go get some experience” is too daunting for them between courses. Maybe, just maybe, we the instructors are making the training too difficult? For whatever reason, we must all understand the one simple rule. Slow and steady will always win the race. This is the message that we must pass on to our current and future students. Sometimes what people do not understand is that by not taking the next step in their diving education, they potentially can make the mistake of going on a dive and biting off more than they can chew. I myself have fallen foul of this, and it is not a nice feeling I can tell you. 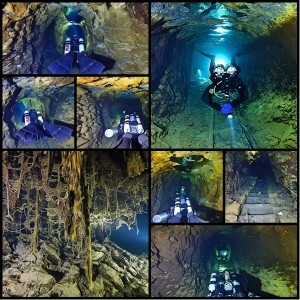 These errors range from the newly certified sidemount cave diver, who then goes and starts to dive really small cave, to the back mount/ CCR/Diver Propulsion Vehicle (DPV) diver to do exactly the same. They dive further into the cave then they should, further than there comfort level will allow. It is at this point in the dive when the voices in the diver’s head start to become louder and louder. This is the point they wish they had undergone proficient training, and taken the time to perfect and gain experience on their qualified level. We all know that when we are stressed we are most likely to make a potential life-altering mistake. This is when you will have wished you had taken a course, listened to a seasoned instructor, taken a proficient well-balanced course and practised these skills. The problem with today is everyone is in a hurry to get to the “destination” and they forget the journey. When I teach any class, especially my cave classes, I always tell my students the dive is the journey, not the turning point. When you take time to learn the skills you just learned from your last class, you not only get more experienced but also log more dives. 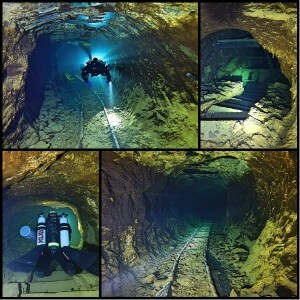 If you have just passed your DPV class for example, and 2 dives later your double stage, double DPV diving to the Blue Abyss (an awesome dive by the way). Odds are your awareness is pretty much zero. On the other hand, by taking the time to build up experience doing the kind of dives you did on the course you give yourself time to grow. If you have just completed your cave class, take time to dive the caves. Take time to learn the cave, learn the jumps. Take time to build your mental awareness up, then by the time you come back for your next level class, or you come back for a CCR Cave crossover, for example, you will hold the awareness of a great diver. Awareness is king for any diver, we all should aim to build our awareness little by little. It is the time taken to dive, learning everything that you can build this awareness. During any of our classes here at ProTec, we teach that awareness comes in three forms. First is self-awareness, this is vital to keeping those voices quite when we are in the inside the overhead by self-diagnosing how we feel, how are we breathing, going through the “what if” scenarios. The second part of awareness is team awareness. Being able to look at your team members and assess how they are mentally and physically. Being able to assess how they are from their light movement. Again going through the “what if” scenarios. The third portion of awareness is global awareness. This involves knowing, understanding reading the environment you are in, knowing what part of the dive plan you’re currently in and what your next waypoint will be. At the same time, you should be going through the “ what if “ scenarios in your mind. All of these combined levels of awareness create a diver that is a valuable team member. I always tell my students the same thing. If you have real awareness, you have spent time in the open water practising hovering, line laying etc. Going through your immediate actions drills for gas problems. I always say “ a free flow is a free flow, be it 5 minutes into the cave, or 125mins into the cave”. A well rounded aware diver will handle it with no problems. Because nothing can replace the experience of having spent time learning and practising the core skills. Be that diver who enjoys the journey, become that diver who you want to aspire to be. Take time to perfect your skills, take your time to become an effective team member. Too many times I’ve seen people diving out of their comfort level because of their mate. “John” has said they would be ok. Being that rock solid diver doesn’t take forever; it just takes a little time, practice and some hard work. We all started with Open Water certifications, now we all dive at different levels. But we all should want to be the best diver we can be, the best team member we can. Sheck Exley once said. “Survival depends on being able to suppress anxiety and replace it with calm, clear and correct reasoning “. I encourage you all to take your time, to grow to practice the skills you get from any course you take, be it an open water course or a cave class. It is these skills you will rely on when the time comes. Enjoy the journey, and dive safely.